I grew up in a family that made exercise part of their everyday routine. I was cross-country running, bike riding and playing club cricket from an early age. You could say its part of my DNA. I don’t know where I would be without it. It provides a stress release, a social outlet; it keeps me fit, healthy and strong and gives me a reason to get up each day. I think we all need something like that in our lives. Cycling is probably my number one sporting love; I can’t take my eyes off it when it’s on the television. I have to read news articles about it when they’re in front of me. I’m on the bike racing, training or commuting almost every day. So I guess you could say that I live and breathe what I do. It’s not just something I do for a living - it is my living. I’ve had the privilege to meet and race with a lot of great cycling identities in Australia over the last two decades, and I have accumulated a lot of knowledge in and around the sport of cycling. I bring with me this experience and my formal training in group fitness and physiology, not to mention my passion for the sport. I aim to bring to my classes my expertise, knowledge, enthusiasm and passion so that you to, can make cycling and health and fitness part of your everyday life. My sessions are always varied and challenging, combining scientific based training methods with a focus on an individuals needs. Come and experience the difference that a Results Based Training Program can make to your fitness goals. Contact me to book your first session. In 2004 I Co-founded an innovative Indoors cycling class (Pedaltek) using heart rate specific training - on the client’s own bike. Successfully coached my personal training clients back from injury. Performed over 150 custom bike fits for cyclists. 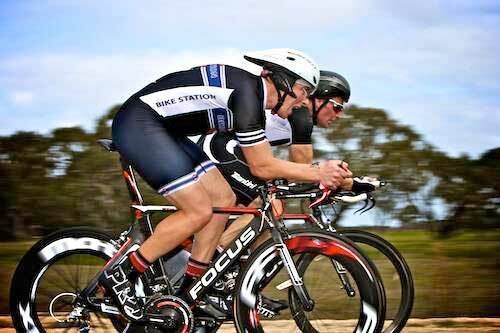 Since 2007 – Raced at an Elite Level in the Rendition Homes Cycling Series. Best results included: 2009 and 2010 Team Winners with the Clipsal cycling team. 1993 – Winner of the 180km State Open Road Title.